Glenwood, part of Raleigh, N.C., is known for its vibrant nightlife–and sometimes for noise, crowds, and crime that comes along with it. Tasked with keeping the nights alive but cutting down on rowdier late-night gatherings, the city council is considering limiting parking and restricting food trucks to help disperse crowds. 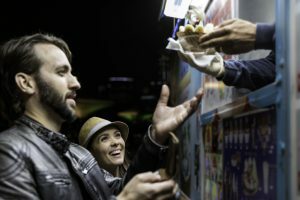 A plan presented to the council would force food trucks to close for the night earlier to nudge people home after brick-and-mortar establishments close, and limit parking for everyone else. Councilmembers are studying the plan, which has met mixed reaction from residents, including students at North Carolina State University. Raleigh isn’t the first municipality to use parking and food truck restrictions and regulation changes in this way. Seattle implemented a successful, parking-based plan to help late-night revelers get home without driving. And food trucks have long stirred up controversy in cities.